Northrop Grumman Corporation’s center fuselage of the F-35 Lightning II recently entered full-rate production. This milestone marks the beginning of a 1.5-day Production Interval (PI) meaning a center fuselage will be produced every day and a half. «Our customers and warfighters deserve the best», said Frank Carus, vice president and F-35 program manager, Northrop Grumman. «Every efficiency, every minute, and every dollar we save reduces costs and speeds up the F-35’s availability to the warfighter. Achieving this pace is a testament to our employees, suppliers and teammates’ commitment to quality and affordability». 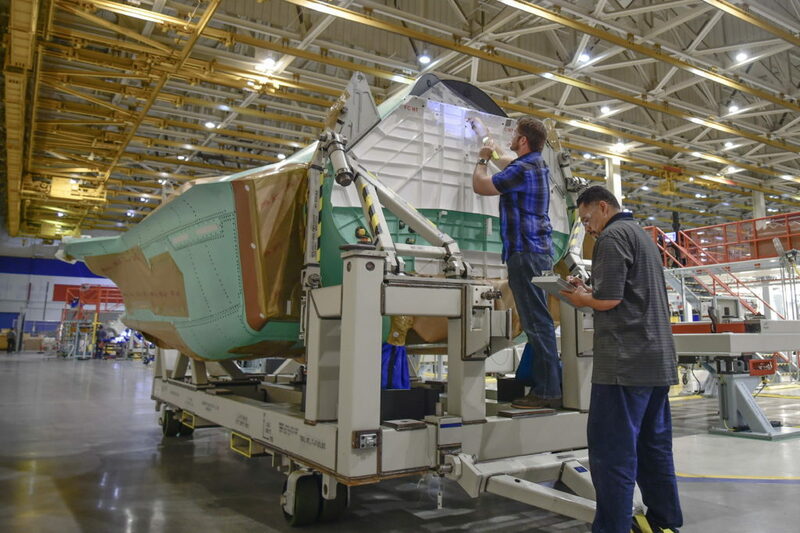 Carus also noted that the 400th F-35 center fuselage was completed and delivered to Lockheed Martin last month and production of the 500th F-35 center fuselage began last week. «This pace of military aircraft production has not been seen in decades», said Kevin Mickey, sector vice president and general manager, military aircraft systems, Northrop Grumman. «Our revolutionary approach on the integrated assembly line pairs advanced technology with data-driven analytics to manufacture advanced aircraft while delivering top quality products on time, and often ahead of schedule». A core structure of the F-35 Lightning II aircraft, the center fuselage is produced on Northrop Grumman’s Integrated Assembly Line (IAL) at its Palmdale Aircraft Integration Center of Excellence. The IAL is a state-of-the-art facility supported by technologies exclusive to or pioneered by Northrop Grumman bringing together robotics, autonomous systems, virtual 3D and predictive automation to the forefront of center fuselage production. «As we prepare for full rate production of the F-35, many of our teammates and suppliers are now transitioning to full rate, aligning their production lead times with the F-35 final assembly that supports increased warfighter demand», said Eric Branyan, vice president of F-35 supply chain at Lockheed Martin. «Northrop Grumman plays a critical role in the F-35 enterprise and we look forward to continuing to reduce costs, improve efficiencies and deliver transformational F-35 capabilities for the men and women in uniform». Northrop Grumman plays a key role in the development and production of the F-35 weapons system. In addition to producing the jet’s center fuselage and wing skins for the aircraft, the company develops, produces and maintains several sensor systems, avionics, mission systems and mission-planning software, pilot and maintainer training systems courseware, electronic warfare simulation test capability, and low-observable technologies.